This is a monumental event in my life. I’ve been dreading the day where I would have to make a perfectly uncracked cheesecake. Yet, I needed to do it, I just wouldn’t bring myself to it because of fear. Fear of the unknown and fear that I would turn out something less than wonderful. Then, i actually got a request for a raspberry cheesecake. I uttered some un-Christianly things in my head, but agreed because I can’t say no to a Miss Cupcake request. So, here’s the culprit: Look at him and his prom date, how cute are they? He wanted something really special for his prom dinner. Now, lets see how this puppy actually turned out……. Ok, let’s start. This is a bit of a daunting task, I know, but you can do it! take out that heavy 9-inch pan and lets go! So now that you have witnessed that even I can make a cheesecake without crying, so now I’ll share with you the recipe. Go make one! This one’s a keeper! 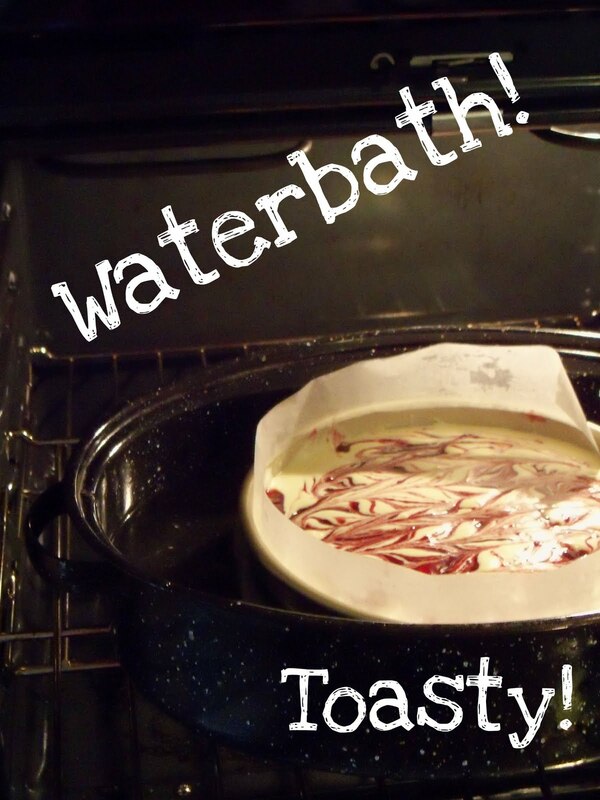 Preheat oven to 350* F. Begin to boil a large pot of water for the WATER BATH! Prepare your pan of choice. I use a 9-inch cake pan due to the fact that spring-form pans actually leak when submerged in the hot tub bath. Butter the bottom and sides of your cake pan. Cut out a piece of parchment paper in a circle and place on the bottom. Then, as shown in the pictures, cut a piece of parchment paper to fit around the sides of the pan. 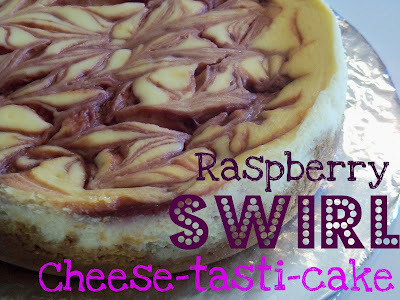 It should be sticking up a little so it will be easy to pull it out when your cheesecake is fully cooked. Mix together the ingredients for the crust. Place all the crumbs in your pan and press on the bottom and up the sides a bit (to your preference). Set the crust aside. 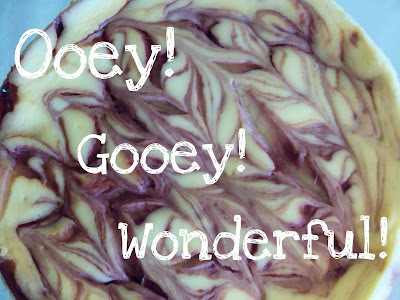 On to the ooey gooey wonderfulness: Combine cream cheese and sugar with electric mixer until completely combined and smooth. Add eggs one at a time and make sure to fully incorporate before adding each one. Add the heavy cream, lemon juice, and vanilla. Mix until completely smooth and delicious looking. Make sure that there are no cream cheese bumps. If there are, smooth them down with a spatula. Pour the cheesecake batter into the crust-covered pan. Tan the cheesecake on your counter to relieve all of the air bubbles (we don’t want any moisture in the cheesecake, this will ensure creamy deliciousness). Next, microwave the raspberry jelly for about one minute. Keep microwaving until the jelly is stir-able. Let sit for a little bit to cool off. Next, dollop the jelly onto the top of the cheesecake mixture. Then, with a knife, cut through the mixture to make a pretty pattern. Make sure that you don’t cut through all the way to the bottom. You don’t want to injure your pretty little crust! Then, take a large roasting pan and put a washcloth in the bottom of it. Place the cheesecake in the roasting pan and pour the boiling water in the pan until the water has covered up to 2 1/2 inches up the side of the pan. Make sure not to splash any water in the pan! Bake 45-50 minutes. It will look like it’s quite un-baked but it is! It will jiggle but the center will be slightly firm. Cover cheesecake, and place in the refrigerator until ready to enjoy. It’s best if you prepare it the night before, then it will be extra creamy and delicious. 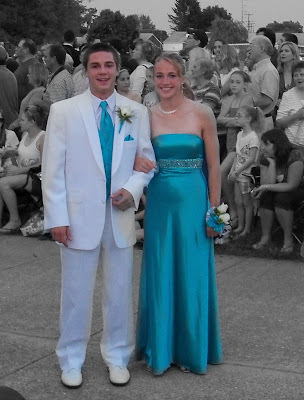 My favorite part of making this was when my mom, a friend, and I went to Mifflinburg’s Promenade for the prom walk. We saw Ethan (the cheese-fantasti-cake culprit) and the only thing he did when he saw me was point at me and yell, “that was absolutely amazing cheesecake!” This made me quite happy. Even though he didn’t call it by it’s proper name (Cheese-fantasti-cake), I was still flattered by the compliment! My creamy fanti-cake days are just beginning!